Tabula Rasa: Challenges for 2012! 1. The Sir Terry Pratchett Reading Challenge hosted at Once Upon a Time - I absolutely LOVE the Discworld series, of course. But I still have a couple of books from the series, here and there, which I haven't read - including the Tiffany Aching novels. There are a whole bunch of Pratchett's non-Discworld books, that I would love to read as well. Not to mention, re-reads. 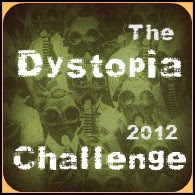 The challenge runs for the whole year, from January 1st to December 31st 2012. You can set your own goals and read as many books as you want! 3. Dystopia 2012 hosted at Bookish Ardour - I haven't read any dystopian fiction, at least, not lately. So, I am not sure if I will like it. Which is why, I have chosen to participate in the "Asocial" level - which means reading 5 novels throughout the year, right from January 1st to December 31st. Who knows, I might even end up liking the genre! I'm pretty sure I'm going to take part in the "Back to the Classics" Challenge, too. I have shelves full of things that I need to finally read. The challenges for next year all look so tempting! Hm.. So there is going to be some serious reading next year. 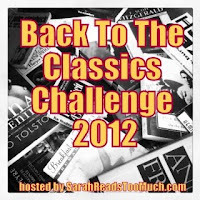 Thanks for joining the Classics Challenge. They really aren't that bad! Plus, it is encouraging me to keep reading all "those" books that I feel like I should have already read by now. 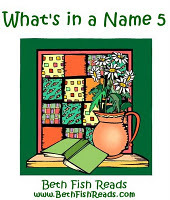 I am also doing the What's In A Name 5 Challenge - so fun!